Garage World uses a patented bracketry system known as MorindaTM Knee & Apex Joints which are a full single piece of steel which wraps around the joints and is secured on both sides with the use of heavy bolts and screws to fix it. At Garage World Townsville we use heavy duty hot-dipped galvanised steel brackets cast directly in to the concrete footing/slab. 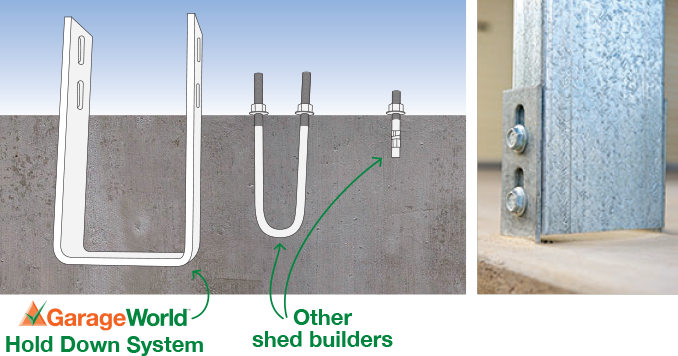 Alternative systems are friction bolts screwed directly into the slab or a 'U Bolt' cast into the slab. The diagram below depicts each system. From the diagram it is clear why we choose to use a bracket cast into concrete it is simply stronger. 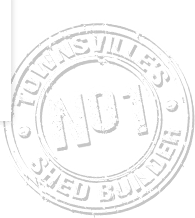 Vermin flashing adds an attractive finish to your shed, along with preventing unwanted critters from entering your shed and is the preferred method by Garage World. Vermin protection can also be installed via a rebated slab system, however we do not use this system as it voids the Bluescope Steel warranty and can result in rusting of the tail ends of your wall sheeting. Search online for "Bluescope Steel Technical Bulletin TB-30" for further information.